The road to WrestleMania is well and truly underway, as WWE make their first pay-per-view stop following WWE Royal Rumble 2019. The build to WrestleMania 35 has been strange in the SmackDown Tag Team Division. The current SmackDown Tag Team Champions are the unlikely duo of the 'best wrestler in the world'.... and The Miz. Shane McMahon and The Miz have gathered quite a following, given their quirky chemistry seems to somehow work with both the crowd and in the ring. However, at Elimination Chamber, they are about to face their biggest challenge yet -- The Usos. 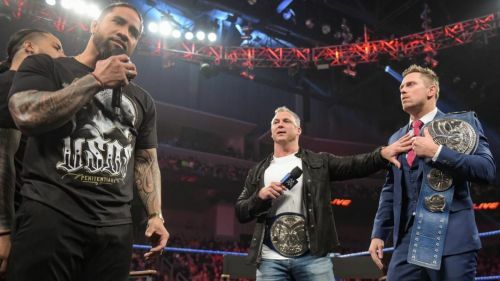 The Usos are former-Tag Team Champions and this Sunday, they are looking to bring a halt to The Miz and Shane McMahon's unlikely run as Champions in the Uso Penitentiary. Given the fact that The Miz and Shane received the Gold quite recently, and this looks like it is heading towards a WrestleMania 35 angle, it was always unlikely that the Usos would receive the win here. However, recent events might further put a spanner in the works for Rikishi's sons. Jimmy Uso was arrested by the police after stepping out of the car, disobeying direct instructions of the officers. WWE is very conscious of their public image, and it would not be a good look to put the titles on The Usos, so soon after they were involved in such an incident. Given that this is not the first time that Uso has been arrested does not help the situation either. At WWE Elimination Chamber 2019, Shane McMahon and The Miz will possibly defeat the Usos, with Shane landing the decisive move to finish them off. Hopefully, the Shane McMahon and Miz storyline is heading somewhere and will give The Miz even more opportunities to exploit his brilliant and entertaining skills in the ring and on the mic.